The other trading name of Totally Transport Community Interest Company is Classic Bus North West that operates private hire and a handful of College contracts. Although Volvo Olympians are generally used on the College contracts there was a need for "cheap & cheerful" spare bus that would cover inspections and times when the core fleet is under repair. The answer was to acquire former Blackpool Atlantean 358 built in 1984. 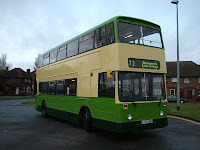 It has been repainted in Classic Bus fleet livery of Southdown green and cream with dark green skirt. 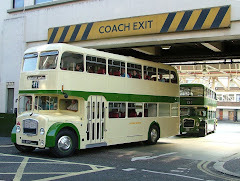 The layout adopted is identical to that applied to Preston Bus' Atlanteans in later years - inspired by the fact that our coachpainter is originally from Preston Bus.